All nylon cord body strong, rugged. Proven design excellent resistance to rib tear. 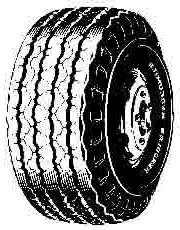 Also available in tube type and tubeless large truck sizes. High mileage compounding eliminates tread cracking. Special cap/wedge construction for cooler running and longer life.